Consider the four entrances in our readings today. When David came to Bahurim, a village to the east of Jerusalem, he was cursed while stones were thrown at him and dust flung into the air around him. David understood this rejection to be part of the consequences of his sin against Uriah and Bathsheba. So too, was his son’s rebellion. Absalom entered Jerusalem to shouts of acclamation, capping off the day by sinning against his father in the same manner as David had against Uriah. The olive had not fallen far from the tree. The Apostle Paul, on his visit to Jerusalem, was harshly received by its citizens; he too was cursed while they flung dust and were about to stone him because he preached the gospel. 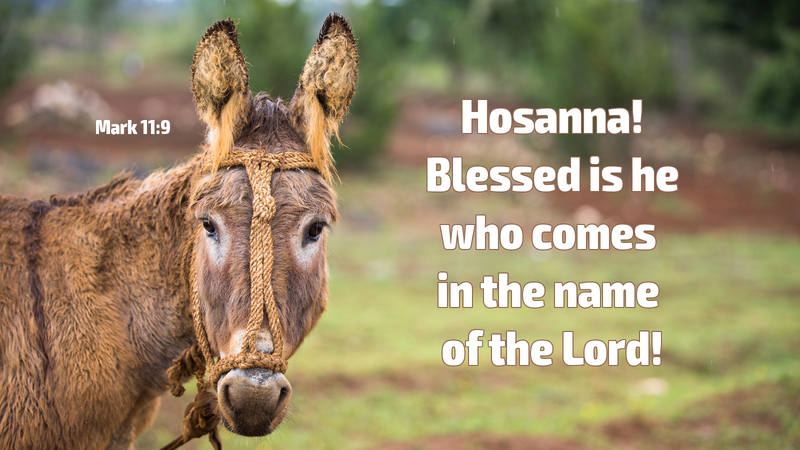 Jesus, however, entered Jerusalem as a triumphant king, to shouts of “Hosanna!” Yet it will not be long before this King of kings will die for the sins of David, Bathsheba, Absalom, Paul, you, me, and the whole world. Jesus bore on the cross the ultimate consequence of all our sins. He died the death we should have died (Rom 6:23), giving his life as a ransom for many (Mark 10:45). As his cousin John had prophesied, this is “the Lamb of God, who takes away the sin of the world” (John 1:29). Prayer: We praise you, Redeemer King, and give you thanks for your triumphal entrance into the world. Amen.